You’re strolling the aisles of your favorite beer store and suddenly you see THAT label again. If you’ve been wondering what the heck “session” or “sessionable” means, you’re not alone – and you’ve come to the right place. Sit back and read on, beer class is in session! Named for the break sessions during the day that World War I era British factory workers were permitted to drink beer with a lower alcohol content, less-boozy brews became known as “session” beers. 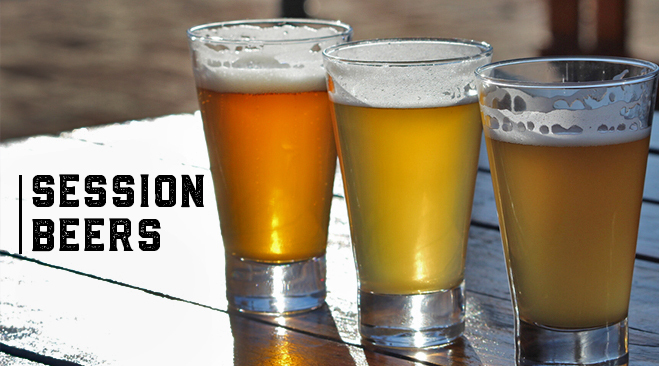 Today, session beers have become a favorite of those looking for an extended drinking experience. With today’s ever-growing number of beer experts, there is some dispute about where to draw the ABV line for a session beer. While England caps session beers at 4%, in the US, a beer is considered a session if it is somewhere under the 5-5.3% ABV range. To complicate things even further, while some use “session” and “sessionable” interchangeably, you may also hear “sessionable” used to refer to beers with a slightly higher ABV but that still work well for a multi-pint drinking endeavor. Some folks also use “sessionable” to describe a session beer, as in, “can you believe that beer is sessionable?” Confused yet? Here’s the moral of this story – in this modern era of increasingly boozy beers with ABVs climbing up into the 9.5-12% range, session beers provide many the same great flavors that you love in an easy-drinking formula that won’t knock you off your stool. Perfect for casual day drinking with your pals, these beers are swiftly gaining momentum as a major beer trend! – Session/able beers are flavorless: Try telling that to a sessionable dry-hopped pilsner! These beers may sometimes have a more delicate flavor than their more booze-filled cousins, but they are certainly not lacking in the flavor department. – Session/able beers can’t be a dark color: Spoiler alert – color is not necessarily an indicator of ABV in a beer! Case in point? Certain stouts – which are still beautifully dark and frothy – are less than 5 ABV! – Session/able beers are those yellow, watery beers we grew up with: In the genius hands of today’s craft brewers, the modern session beer comes in an incredible range of flavors and colors to suit your personal preferences. Summer’s calling and this refreshingly light-bodied lager is ready to answer. Whether you’re working in the yard or just enjoying the great outdoors, this brew is a great go-to for enjoying with that summer weather. With perfectly balanced smooth malt and zesty hops, this tasty blonde pairs well with the hot days, spicy foods, and anything else that summer may throw your way. Take this brew for a spin alongside some BBQ or Tex-Mex and thank us later! Looking for an IPA that you can enjoy all day? Even if this session brew’s name wasn’t easy to remember, we’re guessing you won’t forget it anytime soon thanks to its hoppy aromas and crisp, clean taste. Awesome from start to finish, it’s hard to say whether this cherry Gose could be any more irresistible on a warm day. With an abundance of cherry flavors and aromas and the classic Gose saltiness, this brew is pure refreshment. Juicy Citra and Mosaic hops come together to create this magical brew that’s bursting with hoppiness without packing a high ABV punch. Get ready to get your summer sip session on, things are about to get hoppy! This easy-going Kölsch looks like liquid sunshine and is the perfect sidekick for easy-breezy daytime get-togethers. Lightly fruity and super refreshing, you’ll find yourself reaching for this brew all summer long. Brewed with tangerine and lemon peel, the name of this easily sippable IPA says it all! Be glad this beer is sessionable because Easy Peasy looks as good as it tastes and it’s tough to have just one! While lime and agave may conjure up bad dreams of tequila past, this tart brew is nothing short of a dream—a crisp and undeniably refreshing one. The zippy lime will wake up your taste buds and the delicate agave with round out the flavors of this delectable gose-style beer. Drumroll has us tapping along to its tropical tune! If you’re looking for a sessionable American Pale Ale that is straight up JUICY, the pineapple, orange, mango, and grapefruit flavors in this can won’t disappoint. A Pilsner like no other, Mama’s Little Yella Pils is made with love from honey malts and tasty hops and the end result is definitely something to write home about. When the weather heats up, you’ll be glad that you’ve added this super crushable brew to your family of favorite beers.